Former Cardiff striker Rob Earnshaw fears is only temporary. Cardiff owner Vincent Tan sent Mackay an email last Monday telling him to resign or be sacked. Club chairman Mehmet Dalman brokered a temporary peace between the two men, who will meet for talks, but Earnshaw thinks Mackay's days are numbered. "I think it's inevitable. If things are happening like this now I can't see it (lasting)," said Earnshaw. "The results are not always going to be great. They lost at the weekend and they're not in a great position, but they're doing good. "It's going to be tough because there's going to be a time where they lose a few games and they have a rough patch, so what is the chairman going to do then?" Tan is understood to be unhappy at an apparent overspend on players and reacted when Mackay said he hoped to strengthen further in the January transfer window. 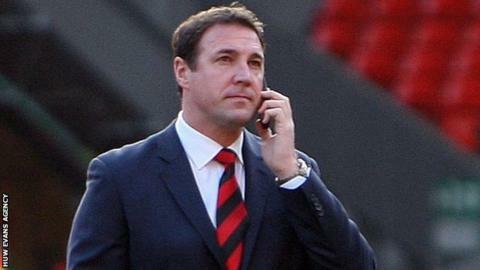 Mackay guided Cardiff to promotion last season and the Welsh club currently sit 15th in the table, four points above the relegation zone. The feeling within the football community is that Mackay has done a sterling job, with the likes of Liverpool boss Brendan Rodgers and Hull manager Steve Bruce supporting their colleague. But 58-cap Wales striker Earnshaw, who joined Toronto from Cardiff last February, says the row at Cardiff has damaged the club and has set many supporters further against Tan. "It's been a little bit unprofessional, it could have been handled better," added the 32-year-old. "I don't know how everything has come out, I don't know how everything has been so messy. "It's not very difficult to miss. The fans just seem they're there to support the manager because of how it's been handled. "It's bad enough that they went and changed the colours of the club (from blue to red) after so many years and so much history, there's a lot to do with that as well. "I think it's more difficult off the pitch when they're not actually playing, because... Cardiff is a club where there's so much going on and the fans want so much information day-to-day. "The players will find it a little bit difficult but they're very good guys, they're very professional so I'd imagine when they go out and they play they're really focused."